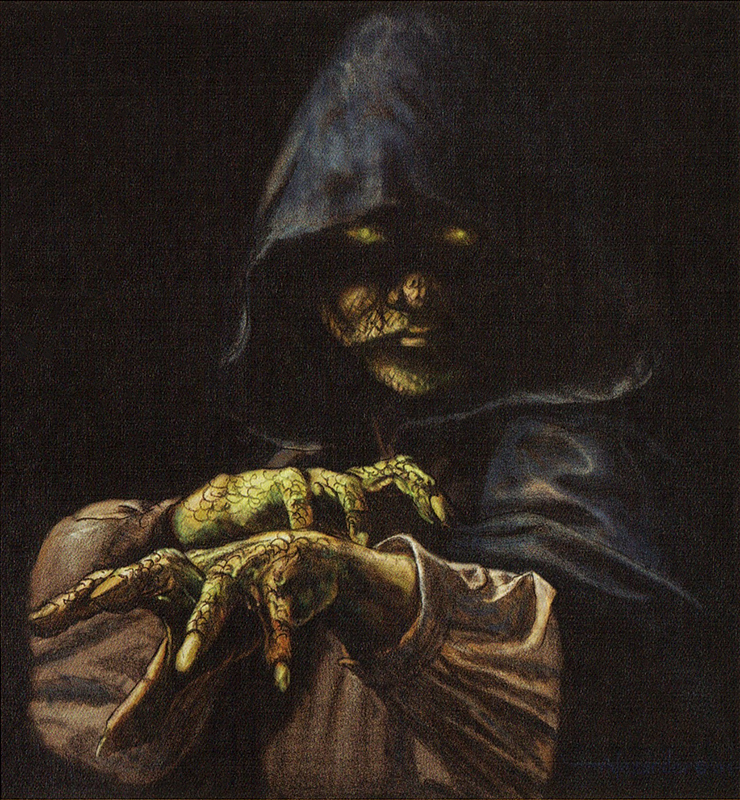 Morgawr was responsible for the kidnapping of Grianne Ohmsford. Huge and muscular. Human in shape but became more like the Mwellrets with which he spent so much time. Scaly grey hairless skin. Features were blunt and unremarkable. Reptilian green eyes. He exuded strength and confidence not usually found in ordinary men. Solitary and independent by nature. A warlock. His Mwellret blood gave him the ability to shape shift. His name was derived from a language of the Faerie World and meant "wraith". Lived for a very long time hidden away in the Wilderun. An ally of the Shadowen, but as he was not one of them he was not destroyed with them. He surfaced about 50 years before the events of the Ilse Witch, expanding his influence to the Federation. With his close affiliation with the Mwellrets and shape-shifters, he arranged for the shape-shifters to spy on a young Grianne Ohmsford after he discovered her magic. He then led a band of Mwellrets in an attack on the Ohmsford house, killing both Araden and Biornlief Ohmsford and kidnapping Grianne Ohmsford. He made the attack look like it had been done by Gnome raiders. He coveted had Grianne, for her power and for the Wishsong. He intended to subvert her and make her his disciple in the study of magic. He convinced her Walker Boh had led the attack, inciting her to hate him. Ostensibly sent Cree Bega and other Mwellrets to assist Grianne on her voyage to follow Walker, but they were actually there to keep an eye on her for him. Appeared in the chambers of Sen Dunsidan to form a partnership with him. He showed Sen his shape shifting abilities in order to demonstrate his powers after Sen expressed some doubt. In exchange for making Sen the Prime Minister, he wanted the ships and crew to enable him to pursue the Ilse Witch on her journey. After fulfilling his part of the bargain, he returned to Sen to claim his crew. Angered by Sen questioning his demands he made Sen accompany him to the Federation prisons so that he could demonstrate what would happen to people who questioned him. He waited, hidden in the interrogation room, while Sen brought the prisoners in one at a time. He then turned them into walking dead men with no will of their own. Darish Venn was the first of hundreds the Morgawr would do this to. Over two nights he changed over 250 men this way. He made them into his airship crews and took them away, never to be seen again. Despite the Morgawr’s death, his actions with the Free-born captives lingered in Sen Dunsidan’s memory and threatened his sanity.